If you caught last night’s State of the Union address, you might have heard mention of infrastructure investment. 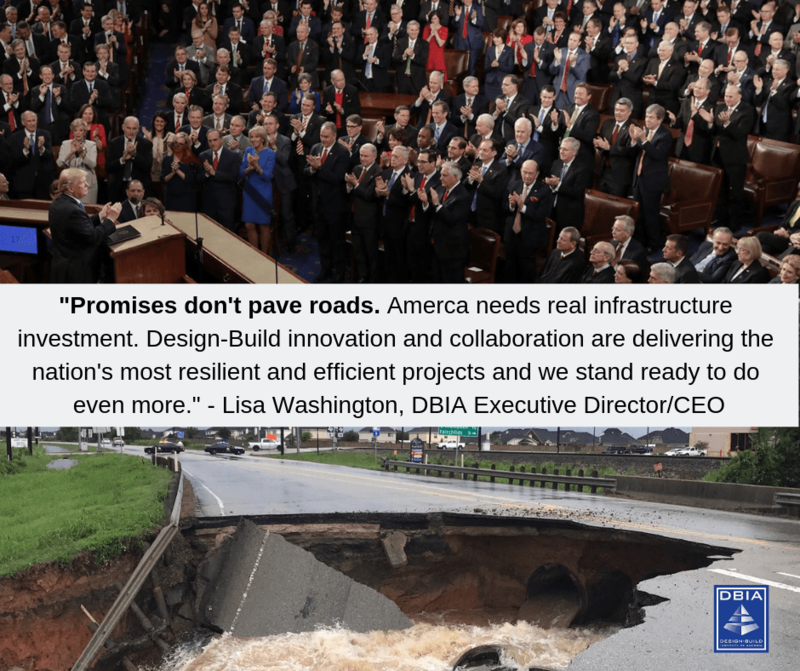 This is not the first time the current administration has addressed infrastructure in the State of the Union, but this discussion was different than 2018, and many took notice. But this plan never turned into legislation, leading to comments from the President last night. Is Washington serious about infrastructure investment this time? American’s design-builders certainly hope so – because promises don’t pave roads. “In this politically divisive era, there are few issues which garner as wide support across parties, regions and states as infrastructure investment. However, even that support has not yielded much more than promises. We can’t pave streets with promises. The president has, once again, expressed his support for an infrastructure package and we urge Congress to seize the moment and begin the hard work of finding the funding to make it happen. A true infrastructure renaissance means America needs to build better, using innovation and collaboration to deliver resilient and efficient projects, while maximizing limited dollars. That’s why design-build is now the fastest growing delivery method in the nation. Many states simply aren’t waiting for Washington and they’ve turned to design-build to deliver the nation’s most cost and time-efficient projects.